Workers, this approach held, were like parts in a complicated machine. If they did the right work in the right way at the right time, the machine would function smoothly. And to ensure that happened, you simply reward the behavior you sought and punished the behavior you discouraged. People would respond rationally to these external forces – these extrinsic motivators – and both they and the system itself would flourish. This insight is worth stopping and reflecting on for a moment. 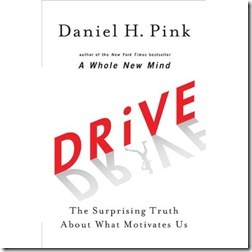 Pink is saying that the traditional way we’ve motivated and compensated people no longer works as well. It works in situations where the work is repetitive tasks measured by rate of completion and quality. However this is not the future of work, it is the past. Pink draws on little known social science research to show that extrinsic rewards are counterproductive to a wide range of goals that companies may have. He looks at the research conducted by Edward Deci. Deci revealed that human motivation seemed to operate by laws that ran counter to what most scientists and citizens believed. From the office to the playing field, we know that what got people going, Rewards – especially cold, hard cash – intensified interest and enhanced performance. What Deci found … was almost the opposite. “[W]hen money is used as an external reward for some activity, the subjects lose intrinsic interest for the activity, “ he wrote. Rewards can deliver a short-term boost – just as a jolt of caffeine can keep you cranking for a few more hours. But the effect wears off – and, worse, can reduce a person’s longer-term motivation to continue the project. Before you just say, “Yeah, everybody knows this.” Stop and think about the implications for every manager in every company on the planet. Think about how carrot-and-stick motivation is used not just as a rewards incentive, but also as threat and punishment. Think about how bribery and coercion, fear and intimidation are often standard practices in organizations. The assumption or rationale behind this approach is that this is how to deal with people and this is the way we do business. Pink presents a way to begin to see that the future of business is not like the past. If the carrot-and-stick is the past, then leading people through intrinsic rewards is the future. He describes three elements for an intrinsic motivation approach. They are Autonomy, Mastery and Purpose. Each is essential for individuals to thrive. Individualized, it is easy to see how the desire for autonomy over the circumstances of our life and work is natural. We can point to skills and talents that we’ve mastered over time. And many of us have a clearly defined purpose that governs our life and work. It is rare, if ever, that businesses organize around the ideas of individual autonomy, mastery and purpose. It is this insight that makes this book a significant contribution not only to the literature of self-development, but also on leadership and organizational development. How do you take a large, complex, global corporate structure and infuse the values of intrinsic motivation into its operating structure. This is the question that lies behind Pink’s claim that the first decade of 21st. century was a period of truly staggering underachievement in business, technology, and social progress. This is one aspect of the challenge that confronts society in the future. The issues are not simply how to motivate or compensate people. Pink provides some helpful examples of companies and movements where the principles of autonomy, mastery and purpose are core values. It is possible to organize an enterprise with intrinsic motivation as a governing assumption. However, do so raises questions about authority, accountability, compensation and the ultimate goal of the company. These are important questions for both today and the future. Drive is more than just a commentary on the social science of human motivation. Pink includes practical ideas and resources for study and application of the book’s ideas. For this reason, the book is a great resource for leadership teams and office staffs. Dan Pink has provided us interesting look into the world of work and provides a perspective that is fresh and helpful. As with his other books, he is giving us material that helps makes sense of the changes that are taking place in the worlds of life and work. The challenge for we, his readers,is to take this wisdom and put it to use in the various social and organizational settings where we live and work. it is my hope this is what will be the result of this fine contribution. Note: This review is also posted at my blog, Leading Questions. Tagged with Business, Daniel, Drive, economy, Edward Deci, extrinsic, intrinsic, motivation, organizations, performance, Pink. Thanks for visiting and commenting Bart. Enjoy the book. Thanks for being a podcast listener too!